The Coastal Skipper theory course is aimed at those who want to sail further afield, cross the Channel, explore France or the Netherlands, or perhaps sail round the UK! This classroom-based course is carried out over 8 evenings and a weekend, or over three weekends. Our instructors may be experienced yachtsmen and women, but they do remember what it is like to be a student. This course takes the theory of navigation to a higher level, and it is strongly recommended that you have completed a Day Skipper theory course as the Coastal Skipper builds on that information. After the course you will be competent navigating a yacht in any coastal waters and further afield. Hard work and great teaching. It is brilliant fun learning new concepts and processes. Instruction and support available between sessions if needed. Comprehensive teaching aids and materials. What if I miss a bit? This happens to us all from time to time, so we are prepared. On day one you will be given a course schedule. If you miss a session we can help with providing slides, online support and running catch up sessions before future classes. 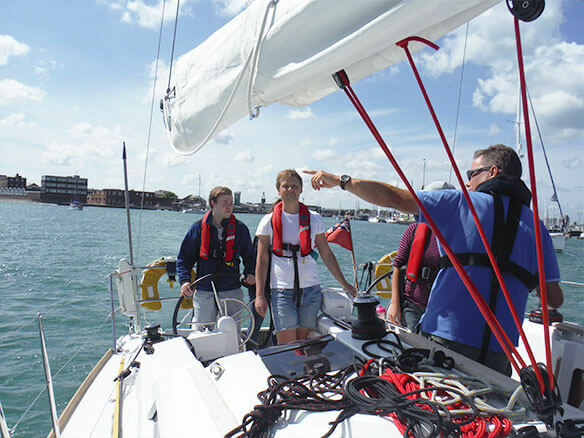 The RYA Coastal Skipper shorebased course is invaluable to those who want to make decisions on board and work towards the RYA Yachtmaster Practical Examination. With the syllabus covering a comprehensive introduction to chart work, navigation, meteorology and basic seamanship, you will obtain the theoretical knowledge required to skipper a small craft safely in tidal waters. This course is a prerequisite for the prestigious RYA Coastal Skipper/Yachtmaster offshore.